Come experience the tranformative power of mantra healing in this intimate, in-depth kirtan with mantrayana practitioner Lee Mirabai Harrington. Mantra healing is the practice of using a combination of sound, vibration, visualization, and our own unique healing instrument–our voices–to heal the body and the mind. The practice of chanting (and singing!) Tibetan and Sanskrit mantras can tonify the body, alleviate depression and anxiety, calm the nervous system, restore health, increase cognitive function and provide protection against future disease and illness. This profound healing extends not only to ourselves, but to all beings. Lee will be accompanied by the musicians and sound healers: Sundar Das Giron on flute, Terrence Pompey on percussion, and Adrian DiMatteo on guitar. No singing experience necessary. All ages welcome. Tickets available through Tibet House. We will post the link here once we have it. 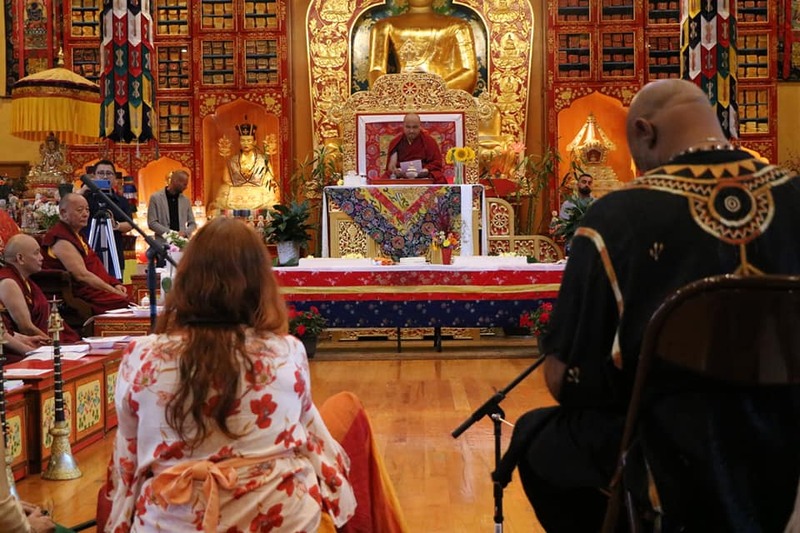 Hailed as “one of the best kept secrets in the chant world,” Lee Mirabai Harrington has sung mantras for His Holiness Karmapa at Madison Square Garden and for Amma at Amritapuri ashram in India. With a musical background in classical Indian vocals, gospel, and sound healing, Lee offers a unique form of Buddhist mantra kirtan, combining the metta and wisdom energies of Buddhist mantras with the heart-opening euphoria of the devotional Bhakti tradition and the profound healing of Tibetan Medical Mantra. For Lee, leading kirtan is not a performance, but rather a truly spiritual, devotional and healing experience. She believes that each of us has the power and ability to heal the self—and countless others—through our own unique voices and through these mantras. Lee’s first album of mantra music, “BEYOND THE BEYOND: A MANTRA MUSIC EXPERIENCE” was released in 2016 to critical acclaim and was included on several “best of” conscious music lists. She is currently working on a new album of Buddhist mantra music with producer Ben Leinbach. She leads kirtans and chanting workshops at festivals, retreat centers, Unity churches, cultural centers and dharma centers worldwide.